A Taiwanese student went blind after she left in her disposable contact lenses for six months – because she was under pressure from her university studies. 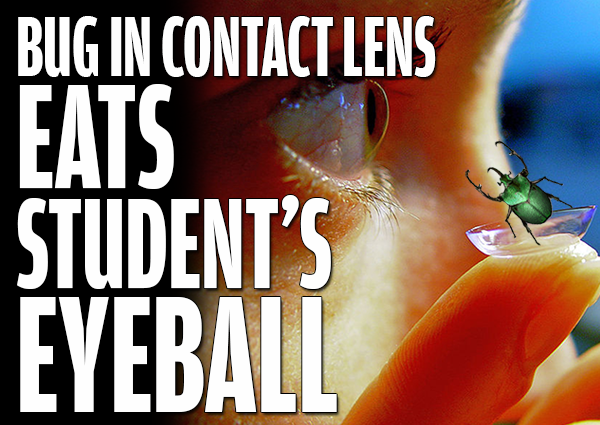 A single cell amoeba bug thrived in the perfect conditions between the contact lens and her eye, leaving her blind. He said that she had been diagnosed with acanthamoeba keratitis, a rare condition more common in the summer. Dr Jian-liang revealed the girl’s case to remind contact lens users about the importance of good hygiene. Her experience adds weight to the claim that university should be a non-contact sport.